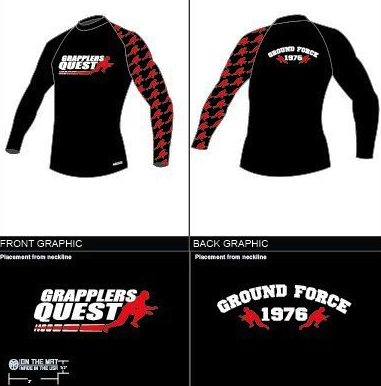 "LOYALTY AND GLORY ARE FOREVER" Long Sleeve Rashguard by OTM and Grapplers Quest - The Original Brands and Sponsors of Grapplling. Highest quality anti-bacterial and anti-fungal material on the market produced by Scott Nelson of OnTheMat.com to protect the athletes and last for several seasons. The design is sublimated and heat pressed, will not peel or fade, it's bright and vibrant for the life of the garment. Be proud to show your Grappling Independence and Bow to No Masters who prevent you from challenging yourself against the World's Best. That fear is theirs, not yours, their intentions are theirs, not yours. Follow your heart, follow the Glory!